This item includes the Monterey Sofa Bed Hardwood Frame and our 8 inch Plush Microsuede Futon Mattress in Full size. Optional Drawers are available at additional cost. The Monterey Sofa Bed is easy to operate, and allows you to quickly convert between Sofa, Recliner and Bed positions in seconds. The frame features sofa height seating for optimal comfort. 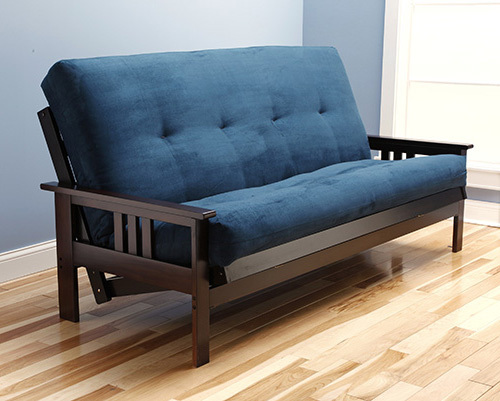 The Monterey Futon Frame utilizes a premium Satin Finish. Constructed with 100% plantation grown hardwood, the Monterey Sofa Bed offers the sturdiest and best looking support. This frame is available as a full size in Natural, Butternut, Barbados, Espresso, Black and White finishes. Our premium hand tufted innerspring futon mattress is available in 7 plush microsuede fabric colors to complete your decor. Assembly Required. This frame is engineered for "Knockdown" style packaging. The Seat and Back decks are not pre-built and require assembly. This allows for a much smaller package which is less expensive to ship than most other futon frames on the market. Adjustable Back Angle, upright or reclined. We ship this item to 48 states via UPS/FedEx Ground with tracking. Most orders ship out within 24-48 hours. Please contact us for shipping rates to AK and HI. The manufacturer warranties this product to be free of defects for a period of 1 year. In most cases, they will simply ship you a new part, however they may either repair or replace the defective parts at their discretion.